E2open Supply Chain Planning System of Record Data Sheet - E2open | Demand. Supply. Delivered. 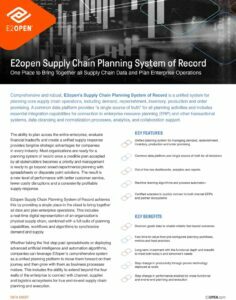 Comprehensive and robust, E2open’s Supply Chain Planning System of Record is a unified system for planning core supply chain operations, including demand, replenishment, inventory, production and order promising. A common data platform provides “a single source of truth” for all planning activities and includes essential integration capabilities for connection to enterprise resource planning (ERP) and other transactional systems, data cleansing and normalization processes, analytics, and collaboration support.